Our hanging birdbaths are made with the quality you would expect. Each is created in cast aluminum, which is rust-free and ladened with a choice of intricate designs. Ideal for Close-up Birdwatching. They are available in a choice of two colors and four different styles. Each is 15" in diameter and includes a 24" chain to hang your birdbath from. It will be hard to choose between our hanging birdbaths and the beautiful look and functionality of our birdbath pedestal combinations. These feature several nature designs and come in a variety of earthtone colors to choose from. Much like the designs on our hanging birdbaths, our pedestal birdbaths feature rustic designs that are cast into the birdbath and pedestal. Both pieces are made from cast rust-free aluminum and are painted with a special weather-proof paint that will withstand the harshest of elements. 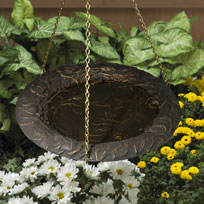 Dimensions: Top round birdbath is 15" in diameter and the matching pedestal measures 26" tall.